After Inari Sushi and Tamago Nigiri, I decided to make Chuka Wakame Sushi for the kids' snack bento on day 3 of my 1 week (actually only 5 school days) sushi theme bento as promised. I added some small flowers made of carrot, takuwan and cucumber because chuka wakame (marinated seaweed) only has the green color on it. 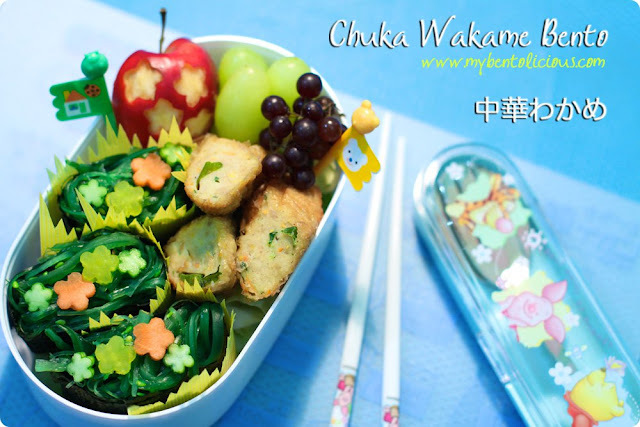 Chuka Wakame is available at Japanese supermarket in small pack. This is one of my kids' favorite sushi and I love it too. Mold the rice by hand and put the nori around the rice and Chuka Wakame on the top. Sometimes I bought Chuka Wakame and put it on my salad, it has light rice vinegar and sesame oil taste. Inside the box : fried kani roll, small Korean apple, seedless grapes and small grapes. If you mold the rice by hand, don't forget to wash your hand cleanly with anti-bacterial soap or you can prepare one small bowl of water with some drops of vinegar and put your hands into the bowl for a few seconds to kill the germs. And if you ever wonder how I crafted some small flowers on the apple, it is pretty easy. I just pushed my small flowers cutter on the apple skin and then used my decorative knife which I just found out is called 'Exacto Knife' to peel the apple skin. If you remember my Tips #005 post, then you can refer to the Red Tool shown at the picture. And if you can't find this Red Tool then don't worry because you can find it at your local art & craft supplies store . It is available at Daiso too. This exacto knife is usually used for Paper Tole craft. so cute with the bright colors and the lovely tiny fruits! another great (temperature-change-friendly) choice for bento lunch. and tee hee, i use x-acto knife too -- isn't it fun finding tools from other kinds of crafts that will also work in bento? lia i have so loved this sushi theme -- i can't wait to see what you do for the last few! My kids love seaweed salad! This is such a pretty bento and I love the mini grapes. So cute! The food looks delicious and the blue hue of the photo is stunning! This is really amazing. You are such an inspiration. It's so cute!! Yummy lunch! I will have to try the apple trick it is very cute! Another beautiful sushi bento! And I learn new things from each one--thank you Lia! So neat and lovely, your work is always a beauty to look at Lia! This one is a garden of delights, I have to remember to try the many mini flowers; I love the effect! dont think i've tried this sushi before but looks tasty. tks for sharing the tip too. @javapot : Thanks a lot Javapot! I did try to do the same thing on apple last time, but I am using plastic cutter, so it is very hard for me to cut through the skin. Probably I need to use steel cutter. @Vanessa : Yes, for sushi rice you have to add vinegar and sugar. But I usually bought the ready pack one and just mixed it with the rice. Hi Lia, Thanks for sharing your bento skills and helpful tips. I too learn from you everyday. Love all the flower shapes, making this bento look super cheerful! You have shared how to make the flower shapes on the apple, did you also use the same tool for cutting the carrots?